The American Kennel Club (AKC) is a registry of purebred dog pedigrees in the United States. In addition to maintaining its pedigree registry, this kennel club also promotes and sanctions events for purebred dogs, including the Westminster Kennel Club Dog Show, an annual event which predates the official forming of the AKC, the National Dog Show and the AKC National Championship sponsored by Royal Canin, formerly the AKC/Eukanuba National Championship. Unlike most other countries' kennels clubs, the AKC is not part of the Fédération Cynologique Internationale (World Canine Organization). 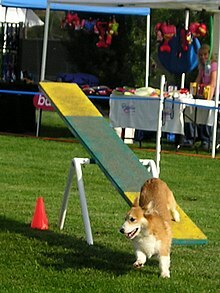 A Pembroke Welsh Corgi participating in dog agility. This particular dog is a multi- titled champion of agility, herding, and obedience. Another AKC affiliate is AKC Reunite,  formerly AKC Companion Animal Recovery (AKC CAR), founded in 1995, which is North America's largest not-for-profit pet ID and recovery service. Another AKC affiliate is the AKC Humane Fund,  which supports breed rescue activities, assists shelters that permit domestic violence victims to bring their pets and educates dog lovers about responsible dog ownership. The AKC has no health standards for breeding; the only breeding restriction is age (a dog can be no younger than eight months). Though the majority of the 170 breed-specific parent clubs have a health committee devoted to their breed's specific concerns, the AKC prohibits clubs from imposing stricter regulations since the AKC Rules Applying to Registration and Discipline  apply to all breed clubs and do not provide an option for breed clubs to extend or override them. Thus, an AKC breed club cannot require a higher breeding age, hip dysplasia ratings, genetic tests for heritable diseases, or any other restrictions. Parent clubs have the power to define the looks of the breed, or the breed standard, and may also restrict participation in non-regular events or classes such as Futurities or Maturities to only those dogs meeting their defined criteria. These non-regular events can require health testing, DNA sampling, instinct/ability testing, and other outlined requirements as established by the hosting club. For these, and other reasons, a small number of breed clubs have not yet joined the AKC so they can maintain stringent health standards, but, in general, the breeders' desire to show their dogs at AKC shows such as the Westminster Kennel Club Dog Show has won out over these concerns. Concern surrounding the AKC's connections to low-quality breeders has resulted in some dog owners seeking to distance themselves from the organization. In October 2012, Hailey Parker, a longtime Coton de Tulear breeder, filed a lawsuit (that was settled) against the AKC and cited the AKC's connections with high-volume breeders among the reasons. The Coton's “reputation and business model is based on a disassociation from ‘puppy mills’ and similar commercial breeding operations,” according to the complaint. The AKC does support several health research initiatives. The AKC Canine Health Foundation funded research that led to the mapping of the canine genome (DNA sequence) with grants totaling more than $2,000,000. Sequencing of the dog genome began in June 2003, funded in large part by the National Human Genome Research Institute (NHGRI) and finished the completed sequence of the entire dog genome at MIT's Broad Institute in 2005. Because people inherit many of the same diseases as dogs, humans can also benefit from health research funded for dogs. [ citation needed]The AKC tracks all dog-related legislation in the U.S., lobbies lawmakers and issues legislative alerts on the internet asking for citizens to contact public officials. They are particularly active in combating breed-specific legislation, such as bans on certain breeds considered dangerous. ^ a b c d e f g h i j k Margaret E. Derry (October 7, 2003). "Producing Beautiful Dogs". Bred for Perfection: Shorthorn Cattle, Collies, and Arabian Horses Since 1800. JHU Press. pp. 48–. ISBN 978-0-8018-7344-7. Retrieved June 20, 2013. ^ a b c d e f g h i Lemonick, Michael D. (June 2001). "A Terrible Beauty". TIME Magazine. ^ "First Things". Dog World. 97 (#9): 10. September 2012. ^ American Kennel Club, Dog Registration FAQ, AKC.org, Accessed June 8, 2009. ^ Rossen, Jeff; Patel, Avni (May 1, 2013). "AKC-registered breeders raising dogs in 'miserable' conditions". Rossen Reports. NBC. Retrieved June 20, 2013. ^ Pilon, Mary; Craig, Susanne (February 9, 2013). "Safety Concerns Stoke Criticism of Kennel Club". The New York Times. The New York Times Company. Retrieved June 20, 2013. ^ "AKC/Eukanuba National Championship". Archived from the original on October 9, 2007. Retrieved October 4, 2007. ^ "Pet Microchip Registration & Lost Pet Recovery - AKC Reunite". akcreunite.org. ^ "AKC Humane Fund". AKC Humane Fund. Archived from the original on September 29, 2015. ^ Donald McCaig (January 1, 2007). The Dog Wars: How the Border Collie Battled the American Kennel Club. Outrun Press. ISBN 978-0-9794690-0-8. Retrieved June 20, 2013. ^ Mark Derr (April 1, 2004). Dog's Best Friend: Annals of the Dog-Human Relationship. University of Chicago Press. pp. 197–198. ISBN 978-0-226-14280-7. Retrieved June 20, 2013. ^ Grandin, Temple; Johnson, Catherine (2005). Animals in Translation. New York, New York: Scribner. p. 82. ISBN 0-7432-4769-8. ^ "About Registration". American Kennel Club. Archived from the original on May 14, 2011. Retrieved April 5, 2011. ^ "Verein für Deutsche Schäferhunde (SV) e.V. : Bekämpfung von HD + ED". Archived from the original on January 6, 2007. Retrieved January 7, 2007. ^ "Bernergarde.org". Archived from the original on February 4, 2007. Retrieved January 7, 2007. ^ "KBS - 2. Massnahmen". Archived from the original on September 28, 2007. Retrieved January 7, 2007. ^ a b c d Pilon, Mary; Craig, Susanne (February 9, 2013). "Safety Concerns Stoke Criticism of Kennel Club". New York Times. ^ "Thedogpress.com". Archived from the original on December 15, 2008. Retrieved December 10, 2008. ^ "AKC Fails to Take a Stand Against Puppy Mills". humanesociety.org. ^ "The American Kennel Club: No longer 'The Dogs's Champion'" (PDF). Retrieved October 7, 2015. ^ "Dog Genome Project". broadinstitute.org. ^ Caninehealthinfo.org, Canine Health Information Center, CHIC Breeds. Accessed March 16, 2011.